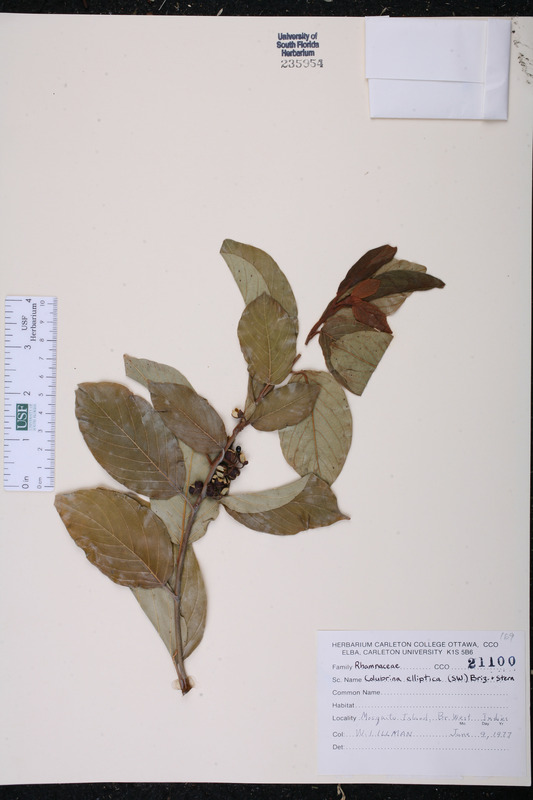 Citation COLUBRINA ELLIPTICA (Swartz) Brizicky & W. L. Stern, Trop. Woods 109: 95. 1958. 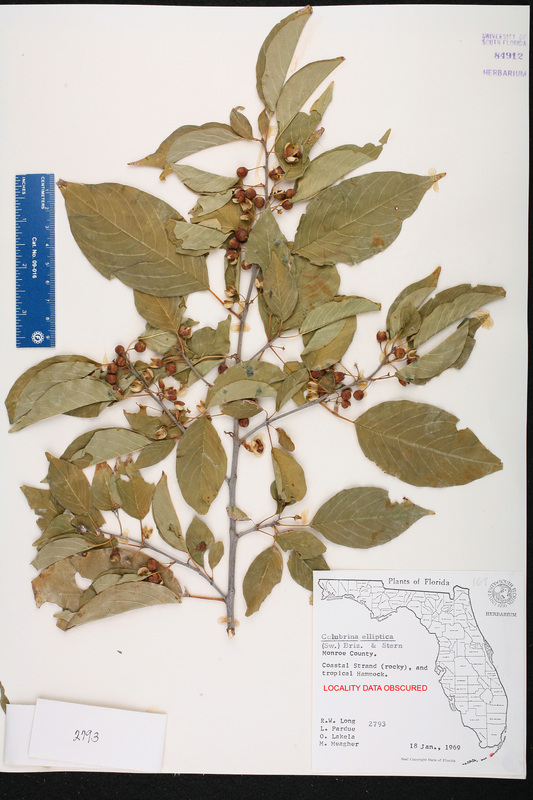 Basionym: Rhamnus ellipticus Swartz 1788. Type: JAMAICA: Without data, Swartz s.n. (holotype: S; isotype: M). Ceanothus reclinatus Ceanothus reclinatus L'Héritier de Brutelle, Sert. Angl. 6. 1789 ("1788").. 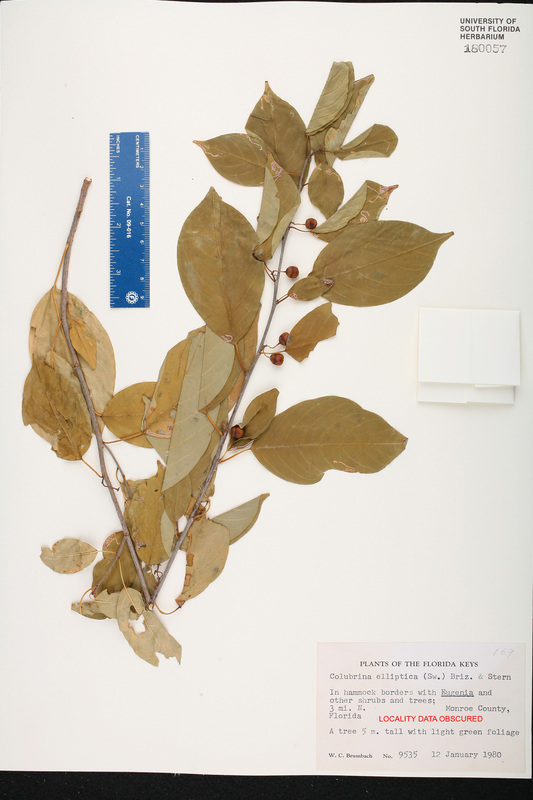 TYPE: JAMAICA: Without data, Wright s.n. (holotype: P; isotype: K). Colubrina reclinata Colubrina reclinata (L'Héritier de Brutelle) Brongniart, Ann. Sci. Nat. (Paris) 10: 369. 1827. 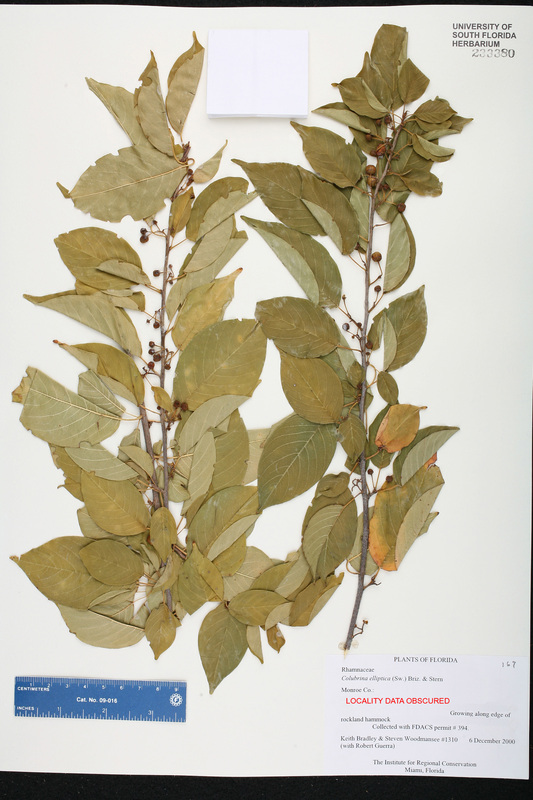 BASIONYM: Ceanothus reclinatus L'Héritier de Brutelle 1789. Diplisca elliptica Diplisca elliptica (Swartz) Rafinesque, Sylva Tellur. 31. 1838. 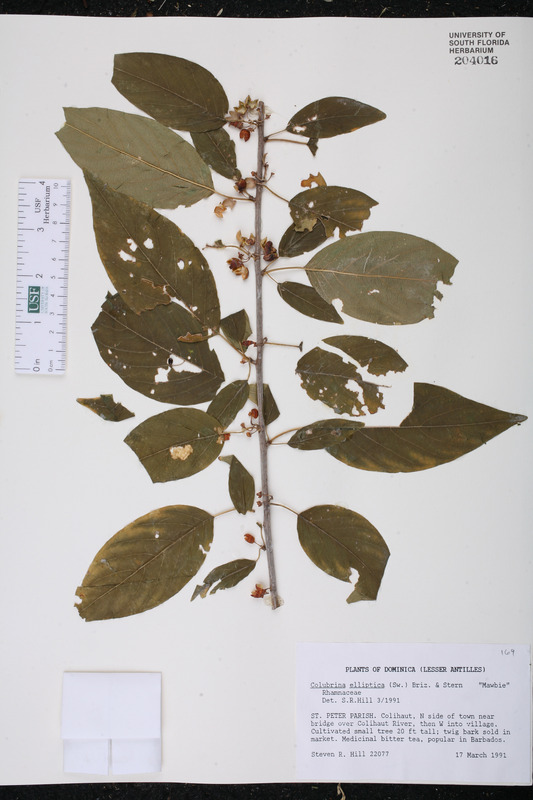 BASIONYM: Rhamnus elliptica Swartz 1788. 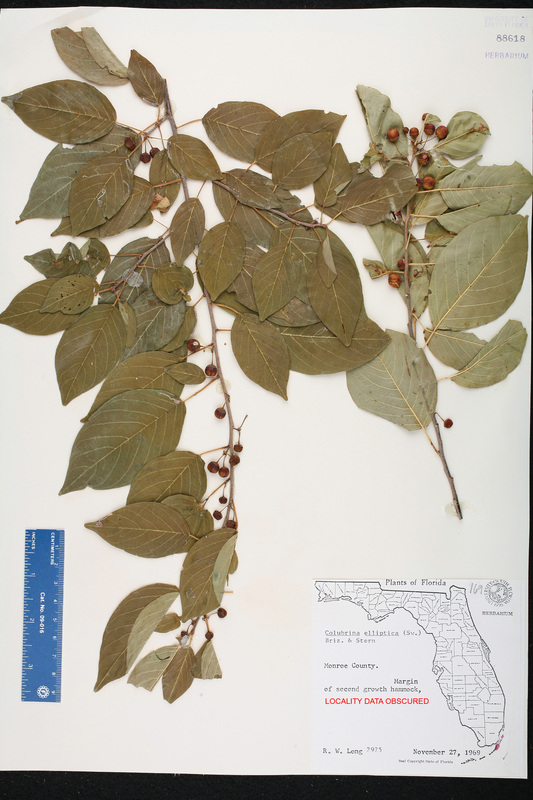 Rhamnus ellipticus Rhamnus ellipticus Swartz, Prodr. 50. 1788. TYPE: JAMAICA: Without data, Swartz s.n. (holotype: S; isotype: M). 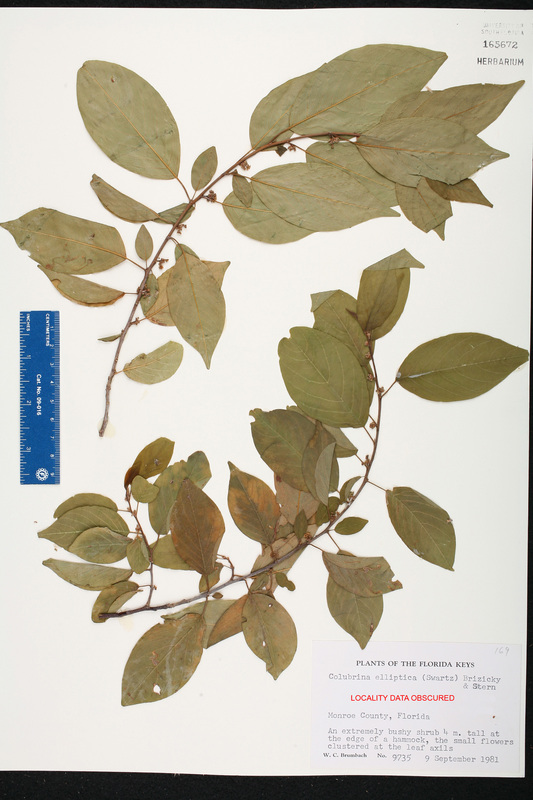 Colubrina hondurensis Colubrina hondurensis Molina, Ceiba 3: 167. 1953. TYPE: HONDURAS: Morazan: Margen de la Quebrada Las Burras, entre Suyapa y Tegucigalpa, 11 Dec 1948, Molina 1801 (holotype: PMA? ; isotype: F). 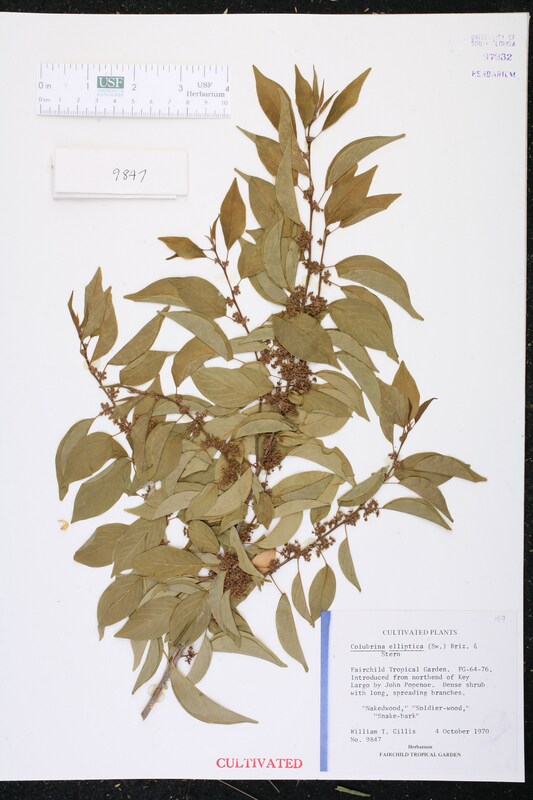 Colubrina pittieriana Colubrina pittieriana Steyermark, Fieldiana, Bot. 28: 971. 1957. BASIONYM: Colubrina venezuelensis Steyermark 1952, non (Suessenguth & Overkott) Cowan 1952. Colubrina venezuelensis Colubrina venezuelensis Steyermark, Fieldiana, Bot. 28: 355. 1952, non (Suessenghth & Overkott) Cowan 1952. 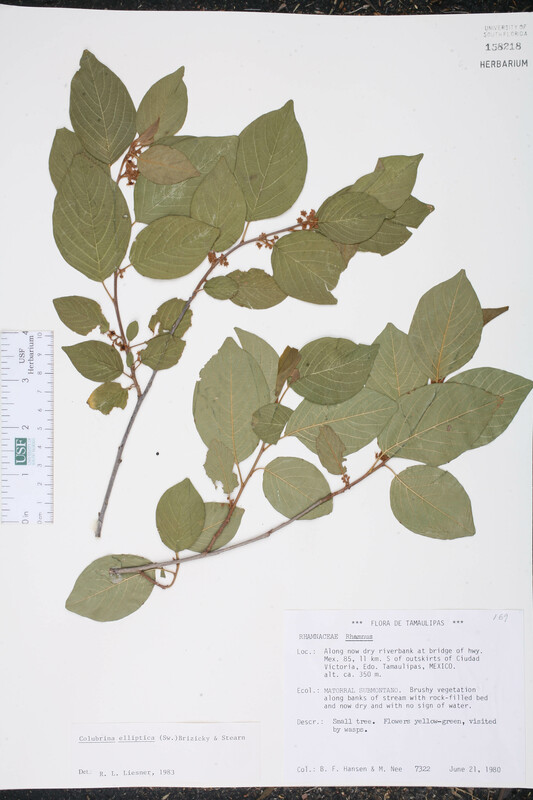 TYPE: VENEZUELA: Distrito Federal: Near Caracas, s.d., Gonzales s.n. 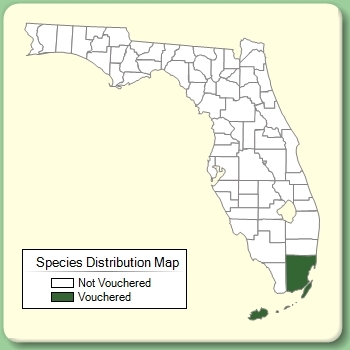 (holotype: F; isotype: VEN). Rhamnidium moreireanum Rhamnidium moreireanum Glaziou, Bull. Soc. Bot. France 52(Mém. 3): 110. 1905. 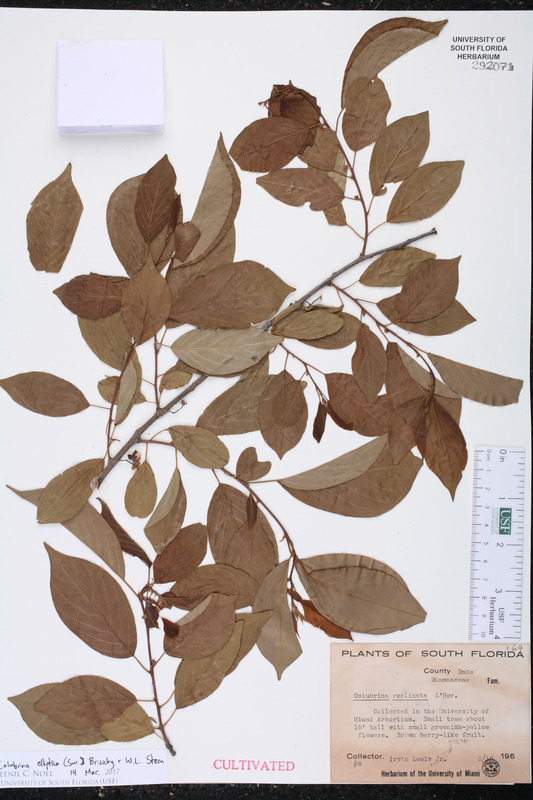 TYPE: BRAZIL: Rio de Janeiro: Lagoa de Rodrigo de Freitas, s.d., Glaziou 15898a (holotype: P). Ziziphus domingensis Ziziphus domingensis J. Saint-Hilaire, in Duhamel, Traite Arbr. Arbust. 3: 56. 1806. TYPE: Cult. in Paris, without data (holotype: P). 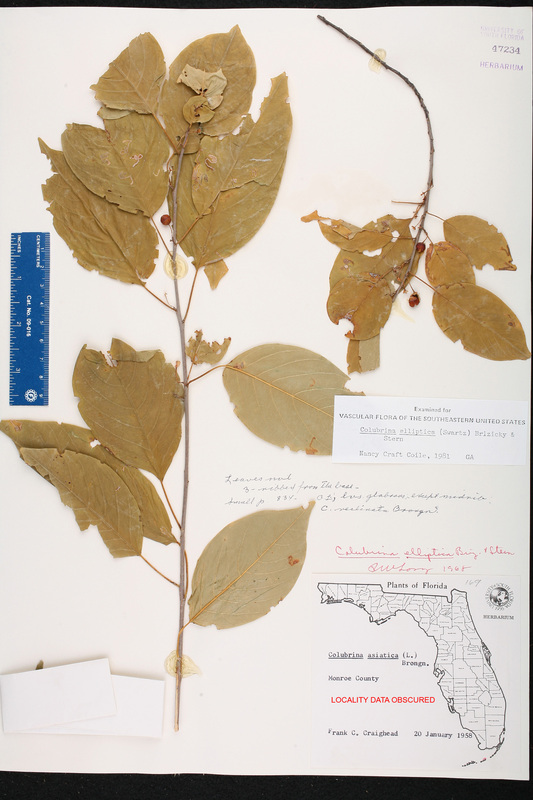 USA Florida Miami-Dade Co. 04 Oct 1970 W. T. Gillis 9847 CULTIVATED; FG-64-76; introduced from North end of Key Largo by John Popenoe. Puerto Rico Guánica Mun. 04 Apr 1985 G. T. Prance 29405 Bark used to prepare local fermented drink called mavi. Dominica St. Peter Par. 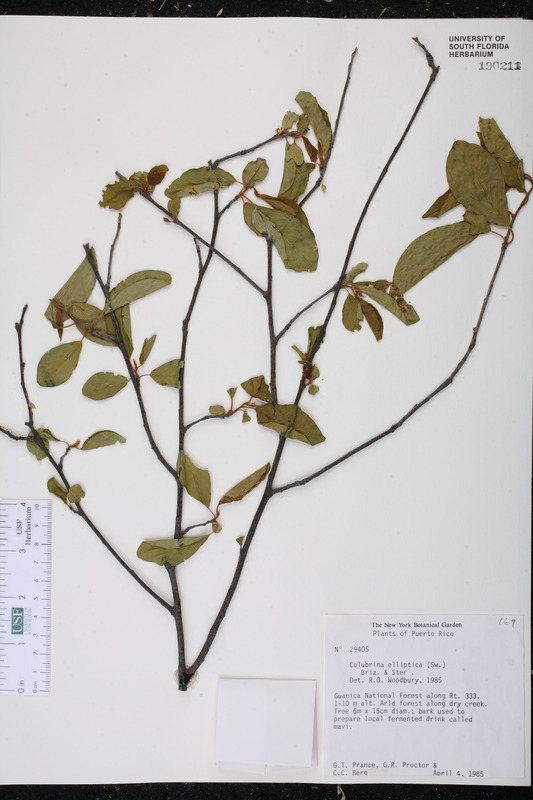 17 Mar 1991 S. R. Hill 22077 Twig bark sold in market; medicinal bitter tea, popular in Barbados. USA Florida Miami-Dade Co. 15 May 1960 I. Lewis, Jr. 8 CULTIVATED.